I just came back from travels in Florida. 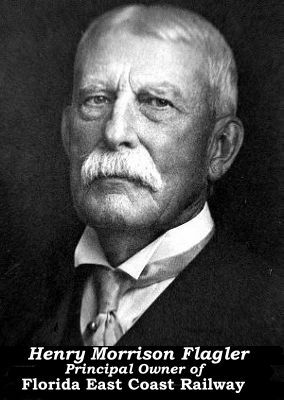 I was in Key West, a place literally made possible entirely by private investment, notably by rich oil baron Henry Flagler. Flagler not only built the first hotel and resort there, he built an over-the-water railroad that connected the Keys to the mainland and made population, construction and tourism possible. Flagler did it all with his own money. Unlike President Obama’s investments in bankrupt “green energy” companies, Flagler did not put billions of dollars from the government at risk. But Flagler invested at a time when there was no federal income tax or tax on profits, so he could easily afford great risk and very patient capital investment. He not only built Key West, he invested throughout Florida, and was a driving force in converting a minimally inhabited and minimally inhabitable swamp into a thriving state providing millions of jobs. Today, everything Flagler did would be impossible due to hundreds of bureaucratic agencies’ thousands of laws, rules, regulations, licenses, interminable delays. It would be infinitely safer and more attractive for a man like Flagler to merely hoard his wealth and enjoy long years of leisurely retirement or to invest his capital outside the U.S. or in tech companies that place most of their jobs outside the U.S. – which is what the Henry Flaglers of today do. Warren Buffet recently bought a railroad, but that’s a very rare Flagler-like move these days. In Orlando, of course, there is Disney World. Similarly, there is no way Walt Disney could create Disney World in today’s business and government climate. Imagine trying to buy up hundreds of thousands of acres of land in secret and consolidate them, and construct that huge metropolis, without being stopped by the sanctity of six spotted brown frogs living in the middle of it, without being deterred by sky-high taxes. If today’s government and tax system had existed in Flagler’s day, Florida would still be a swamp. If today’s government and tax system had existed in Walt’s day, there’d be no Disney World. And today’s president is full-speed-ahead focused on demonizing the Flaglers of today, making capitalists into villains, He’s piling on taxes, creating gigantic new regulatory agencies layered on top of current agencies led by unaccountable czars, promulgating hundreds of thousands of new rules and regulations. If Obama had been there then and had his way, Henry Flagler would have been denied the right to build his railroad, slowed to a crawl in his development in Florida by regulatory burdens and mountains of red tape, taxed to the point of making his risky investments asinine, and demonized as a monster failing to paying his fair share. In today’s climate, Walt would have had no choice but to chuck his grand plans for his shining city – or take them abroad. Obama hates the very idea of private sector solutions and economic control; it’s contrary to his story line: only big and bigger government can create jobs and provide for all. We’re now running TV commercials to advertise the joy of dependency on food stamps – not commercials celebrating the self-reliance of self-employed job creators and encouraging people to find something profitable to do. Is this the kind of environment we want? One so discouraging to private investment and enterprise that virtually every “U.S. company” of size is pouring far more of its resources into building plants, opening stores, even building theme parks, and creating jobs abroad than here? (Some honest, competent journalist might do a great story on that: review of the entire Fortune 1000’s investment here vs. investment abroad, company by company by company.) One so discouraging to people considering starting a business and sacrificing for years to finally get rich – yes, I said that! – that huge numbers back away. Each time that happens, space isn’t leased or offices and plants aren’t built. Jobs aren’t created, vendors aren’t fed. Does this serve anybody’s best interests? The majority of Americans favored the Keystone pipeline, killed by the president. A Rasmussen poll this week has 54 percent favoring a flat tax, with everybody paying the same percentage of income, regardless of amount of income – something the President would light himself afire to oppose.